On a cool but pleasant Saturday with a light westerly breeze and a pitch in great condition ‘Ensians were anxious to get back into winning ways .There was a crowd approaching 100 due to an excellent former players get together taking place organised by Peters Tempest and Swann.The team sheet included father and son Richard and Jack Smith in the second row. ‘Ensians made a bright start quickly moving into Baildon territory and after five minutes passed the ball along the line to Greg Jones who created an overlap and passed to Declan Jackson who beat his opposition to score an unconverted try in the corner. However after nine minutes after the home side had gained scrum ball against the head Baildon quickly recovered and their speedy winger raced over to score a converted try between the posts to take the lead by 7points to 5. ‘Ensians took control after this setback with Will Foster making a great break resulting in Ben Smith being tackled just short of the line ,Jack Smith showing up well in the linesout,and subsequently outstanding work by the forwards resulting in a penalty goal by Will. Foster to regain the lead for ‘Ensians after 20 minutes by 8 points to 7. The rest of the first half belonged to the home team .After 27 minutes a lovely move across the backs enabled Declan Jackson to take the Baildon defence and a good pass to Olly Eaves sent him over for an unconverted try. A few minutes late Olly Eaves repaid the compliment in a similar move for Declan Jackson to score another great try this time converted by Will Foster to make the score 20 points to 7 points in favour of ‘Ensians..Despite a brilliant touch being found by Luke Freer from a penalty kick and fine efforts made by Will Howarth the Baildon defence held firm to keep the home team at bay until half time. Playing against a light breeze ‘Ensians started the second half in the ascendancy. They spent the first 20 minutes in the Baildon 22 at least ten of which saw them camped on the Baildon line .However try as they could the Baildon defence held firm. The tipping point of the game took place after 20 minutes. In their first foray of the half into home territory,Baildon took the ball from an ‘Ensian throw in and an excellent move across the backs resulted in a converted try reducing ‘Ensians lead to 20 –14.It was “game on” .The visitors sensing a possible victory attacked with renewed vigour .One of their attacks broke down with a knock on and shortly afterwards Josh Dyson relieved pressure with a touch kick from a loose ball.Baildon continued to exert pressure and it was now their turn to get within the ’Ensian 5metres line. However strong work by all the ‘Ensians forwards prevented Baildon scoring the all important try but a penalty was conceded an converted by Baildon to close the score to 20—17 with five minutes plus injury time to play. These last few minutes seemed interminable Baildon attacking continually but the defence held firm. 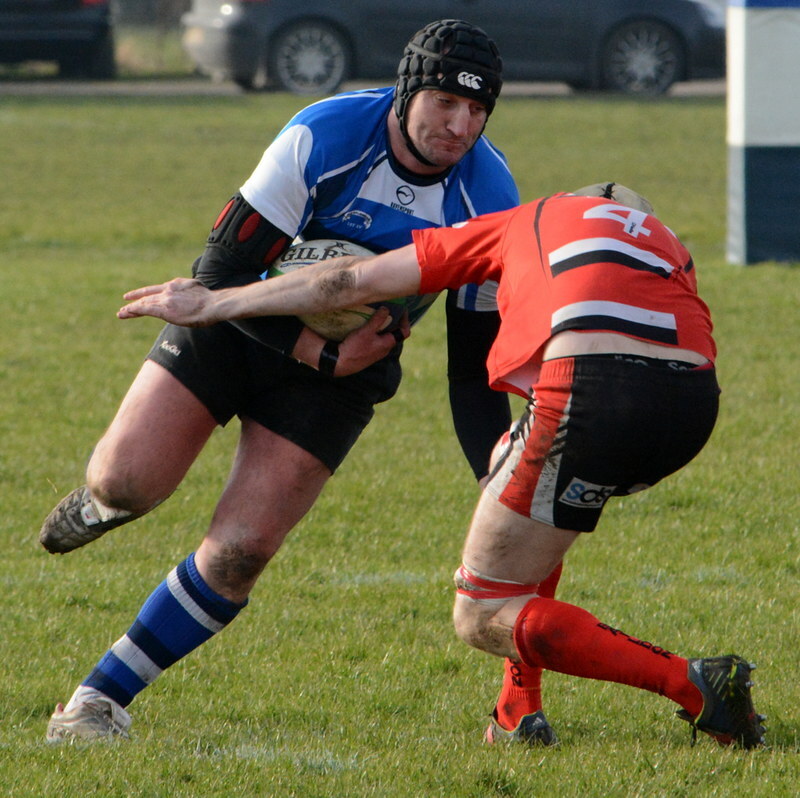 The forwards led by Rob Arbuckle worked like Trojans and the tackling of the whole team was of the highest order. In one last throw of the dice Baildon were awarded a penalty wide out with one minute to go and the hitherto reliable Baildon kicker hit the upright much to ‘Ensians relief and Baildon’s chagrin. This was an exciting hard fought win against a rejuvenated Baildon team and the success was undoubtedly due to the will to win character and determination of the ‘Ensians team.